properties can be difficult, especially before the numbering in 1895. These snippets chart some of the changes, and may help to locate traders. The Argus, 1st August 1890. Bespoke Uppers on the shortest notice. 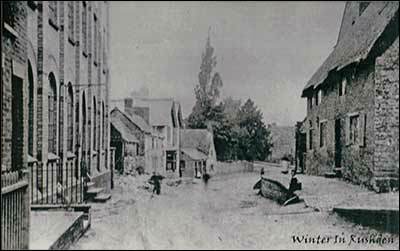 An early picture in winter of the central High Street. Caves' factory left, and house opposite were lost in the 1901 fire. MESSRS. CAVE'S FACTORYThe Easter holidays were extended until Friday last, so as to allow the machinery being put into the new portion of the factory, which is now being utilised. The alterations to the front of the factory in High-street, by which part of the premises will be converted into lock-up shops are now in progress. 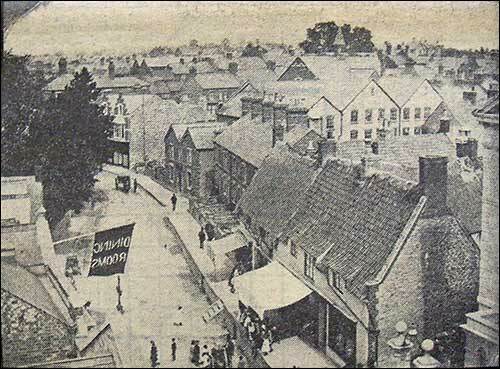 Another early picture of the central High Street. Before the Great Fire of Rushden, the high pavement in front of the High street cottages provided a fine gallery when organ grinders paid a visit to the town. Although this picture is old and faded, and it is difficult to see what the tiny figures are doing, it appears that an organ grinder had taken his stand in the middle of the street. Workmen clearing a site in High Street, Rushden, on Tuesday uncovered this old well, which must have been concealed for at least 50 years. 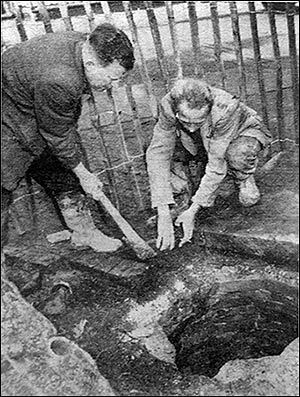 The men, employed by Arthur Sanders Ltd., were clearing a site next to E. Warren Ltd., butcher's shop, for the building of a new shop for that firm, when they uncovered the old well. They knew it was there. The well, which was in general use in Rushden's village days, was found to be 22 feet deep and contained 18 feet of water. It was lined with brick near the top and stone in the lower parts, and had a lead pipe running to the bottom. The well will not be filled in; the workmen will re-seal it.